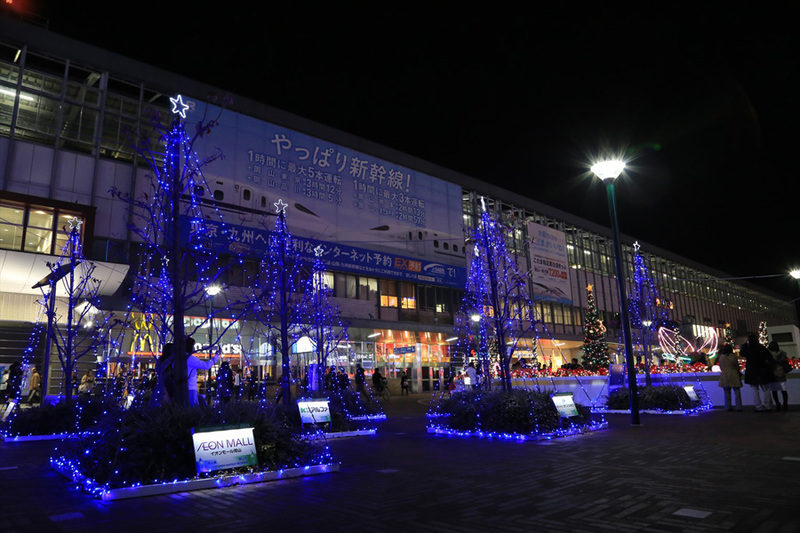 (December/08/2018)Welcome to Okayama Japan, the Land of Sunshine!! 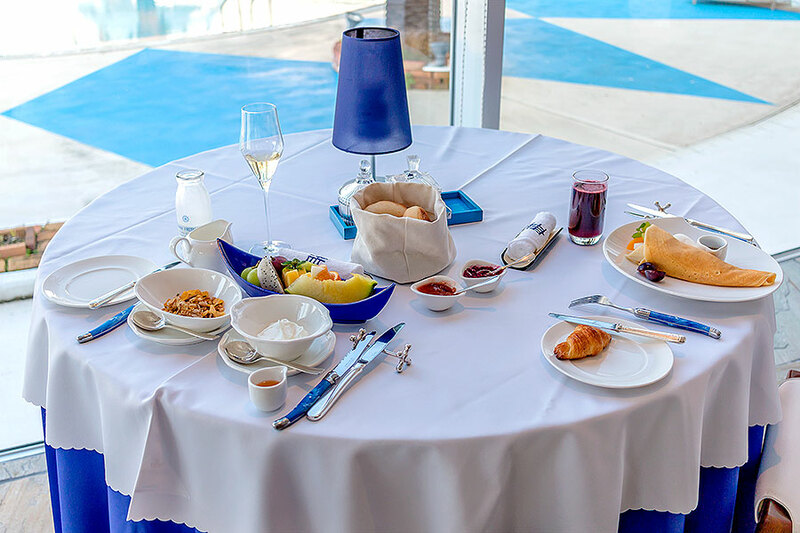 A delicious breakfast spread at Hotel Limani. Hotel Limani and its iconic grecian colonnade decorated in Santorini-style blue and white. 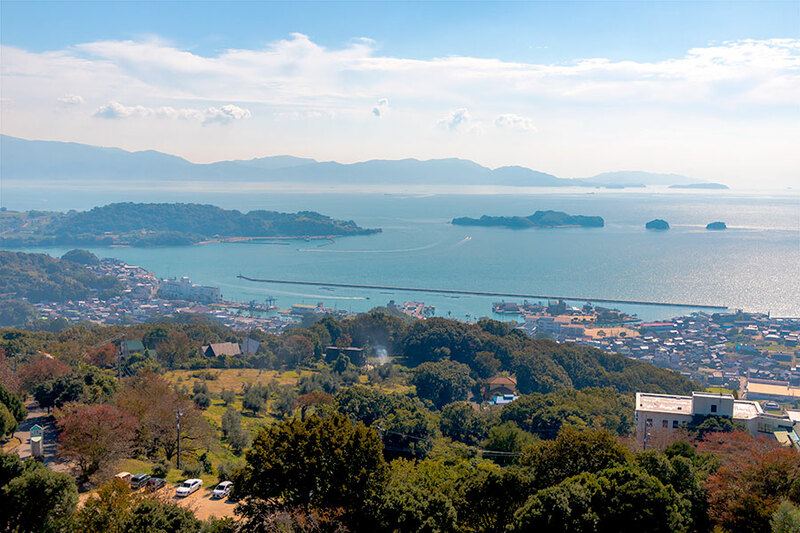 A view of the Setouchi from a nearby olive grove overlooking Hotel Limani. Hotel Limani’s stately lounge features antique teacups, books in various languages, a grand piano, and a separate cigar room. Shoko Yamagichi (left) guides us through some relaxing exercises in Hotel Limani’s gym studio. 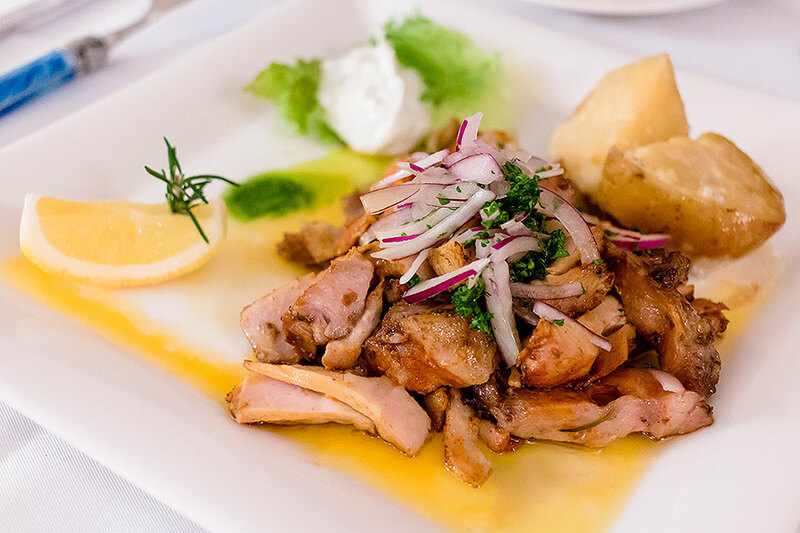 Hotel Limani’s award-winning Greek chef utilizes local ingredients wherever possible in his pursuit of culinary perfection. 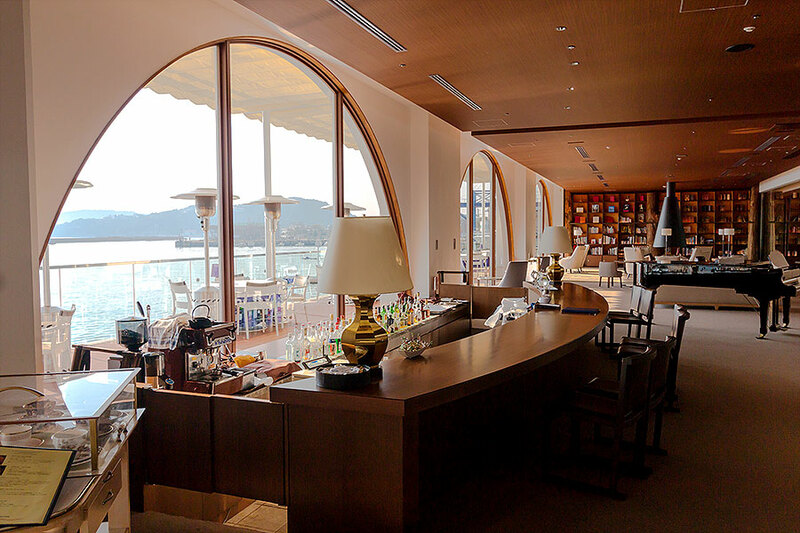 Hotel Limani doesn’t merely stand beside the Setouchi Sea—it embraces it. From the panoramic lobby on through the restaurant, lounge, exercise room, spa, and outdoor pool with its swim-up bar, one is never without an arresting view of the sea. In fact, when you book your stay, there’s no need to ask for an ocean view—for every one of Hotel Limani’s sumptuous guest rooms faces the ocean. Though located in Ushimado, part of the Japanese mainland in Okayama Prefecture, Hotel Limani stands as an island unto to itself, complete with a stunning Grecian colonnade, and a view celebrated as one of the “100 best sunset spots in all of Japan.” My partner and I were eager to see if the sunset at Limani lived up to the hype, but having arrived a little before noon, we knew we’d have to wait to find out. At the counter, a Greek staff member welcomed us in English and, after a brief check-in, showed us our room, tastefully appointed in Limani’s signature blue and white—reminiscent at once of Santorini island. Our room featured couches, a seaside balcony with chairs, and a spacious shower and bath decorated in a lovely Grecian tile. After spending most of my nights in Japan on a futon rolled out on the floor (the traditional Japanese sleeping arrangement), the western style beds felt like a true luxury. 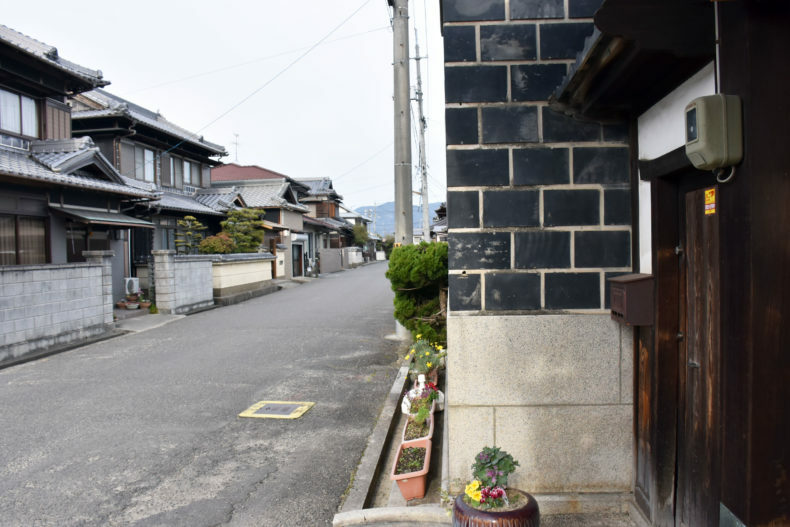 As it turns out, Ushimado’s international history stretches back as far as the Edo period, when it served as a gateway for Korean envoys. Today, Limani expands upon that tradition with staff members from 14 separate countries,and the linguistic capacity to receive guests from all over the world. 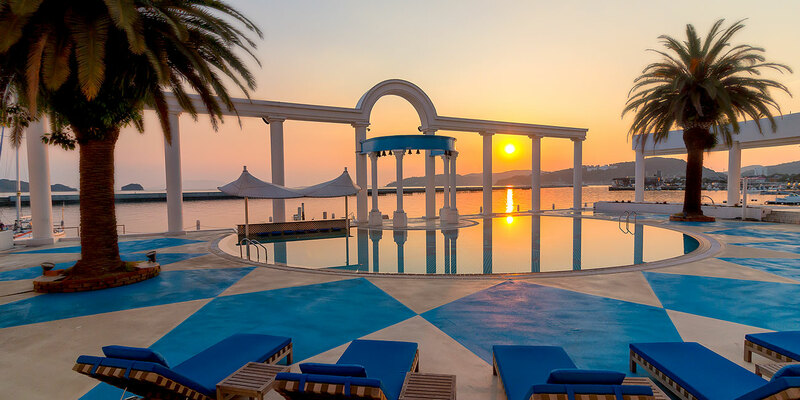 Even the word “Limani” itself comes from Greek, meaning “bay” or “port,” though Hotel Limani’s connection with Greece goes much deeper than the name. 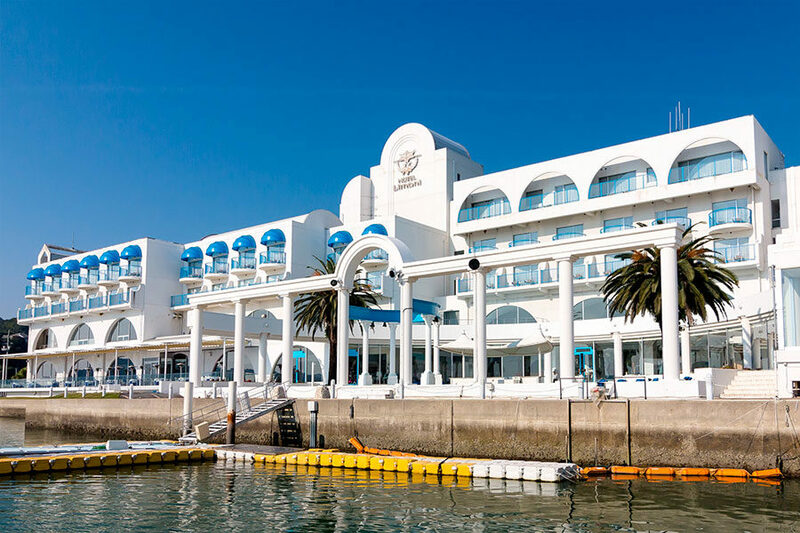 Settled on the edge of the Ushimado-cho, a branch of the Setouchi Inland Sea known colloquially as “the Agean Sea of Japan,” the farmlands surrounding Hotel Limani produce some of the best olives, mushrooms, and lemons in the nation. Quite naturally John Yanni Diacos, the award winning Greek chef in charge of Limani’s restaurant, The Terrace, sources much of his ingredients from Limani’s own gardens. As we sat down for lunch—the first of many memorable meals we would relish during our stay—we felt an almost visceral sense of comfort as plate after plate of beautifully arranged, authentic Greek food graced our table in succession. Consistent with their standing as a hotel and spa, the delicious and healthful cuisine added tremendously to the rejuvenating feelings characteristic of our entire stay at Hotel Limani. In the interlude between lunch and dinner, we decided to while away some time in the gym studio, where Miss Yamaguchi guided us through a relaxing set of stretches and exercises. Afterward, my partner went in for a facial of organic essential oils and a dip in the seasonal, ladies-only lemon bath, while I relaxed beside the fireplace in Limani’s sophisticated lounge. Before we knew it, the sea lit up with the warm glow of evening, and together we stood outside in Limani’s poolside courtyard, with a sense of deep relaxation rarely afforded to travelers. As the general manager of the hotel informed us, the average stay at Hotel Limani is one week, and at the end of our first day there, it was easy to see why. As we watched the sun set at last over the shimmering waves of Ushimado, we lost all sense of time and place. Were we travelers along the beautiful Setouchi Sea? Or Mediterranean island hoppers watching the sun sink into the Aegean? Either way—there in that moment, we felt perfectly at home. 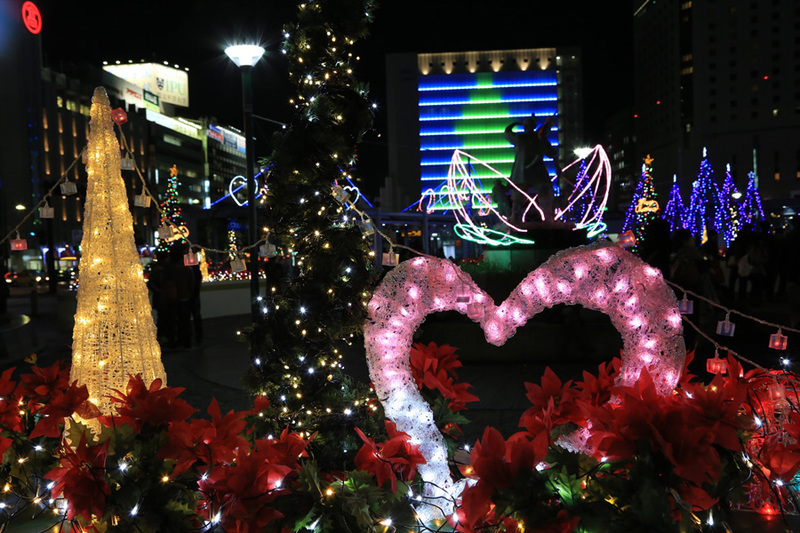 The first Kobe Luminarie was held in December of 1995 to commemorate the victims of the Great Hanshin Earthquake (January 1995) as well as to reinforce hopes and dreams for reconstruction and revitalization of the city. Since then, the Kobe Luminarie has been seen by many as a symbol of Kobe, and it has become a definitive characteristic of the area. In 2015 the covered illuminated corridor “Galleria Coperta” made its debut, a feature where guests can pass through a tunnel filled with lights. You can truly feel the power surrounding you in the tunnel as you are wrapped in light from all sides. Around 6:00 p.m. to around 9:30 p.m.
(November/29/2018)Welcome to Okayama Japan, the Land of Sunshine!! 1,000 years ago, during the Edo-period, Bizen Osafune was the top sword making school in Japan. Cities tended to form and grow near a water source, since ships were a common method of transporting goods, and Osafune was no different. The main road during the Edo-period, stretching from Kyushu to Kyoto passed through Osafune. This meant that the small city was in a great position for trade and production. The craftsmen of Osafune could easily observe the market and the demand. When Japan lost the Second World War, America seized all the swords they could get a hold of from Japan. About 2,000,000 swords were taken, but 5,500 have been returned since then due to cultural and historical value. The other missing swords were likely discarded. There are very few places left today where you can see the traditional Samurai swords and learn the history of Japanese sword making. 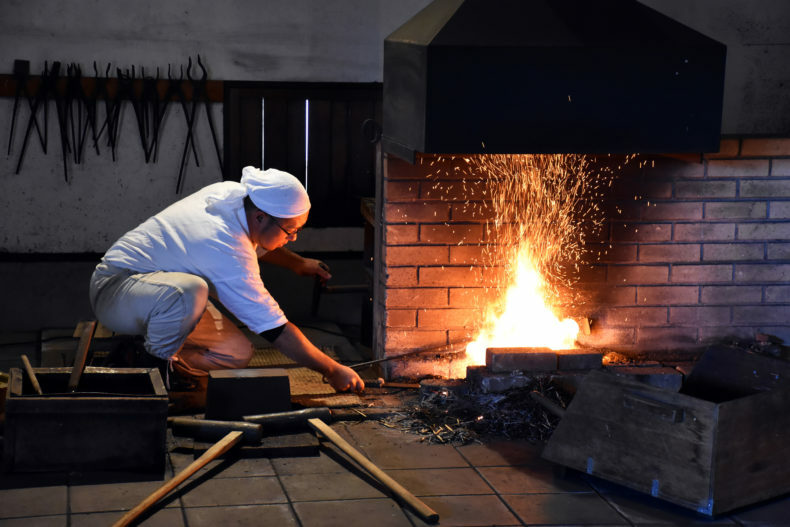 Bizen Osafune sword museum is the only place in Japan where you can see all the steps of making a Japanese sword. Bizen Osafune sword museum is a unique museum where collections of samurai swords are on display. The fashion of swords has changed many times throughout time, and thus different time periods each have unique swords. It is very interesting to see how the traditional Japanese samurai swords are made. 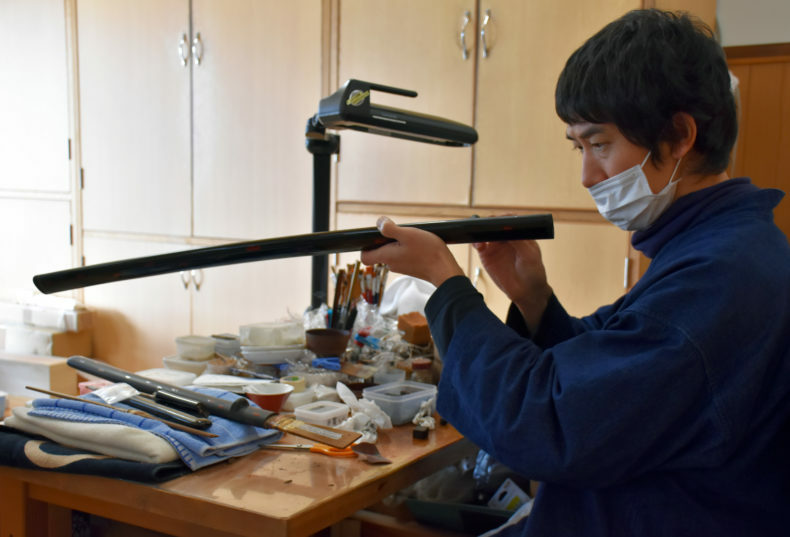 There are 11 craftsmen involved in the process of making a Japanese sword. The souvenir shop sells a variety of items, such as imitation swords, paper knives and other little knickknacks. If you happen to be crazy about swords, you can see the real samurai swords for sale. A short sword called ‘wakizashi’ is sold from 350,000 yen. Just remember that as a sword owner you will need to register your sword with the authorities in Japan. If you want to bring your sword home with you, then you will need the appropriate import papers. A free English speaking volunteer guide is available, but needs to be booked in advance. Please contact the Bizen Osafune Sword Museum two weeks in advance by phone or email. Every second Sunday of the month, between 14:00-15:00, you can see a free demonstration on how to temper a sword. You can also take part in a workshop to learn how to make a paper knife. This costs 1,500 yen and takes approximately 1,5 hours. Prior reservation is needed at least 2 weeks in advance. Open: Every day expect Monday and the day after a national holiday. 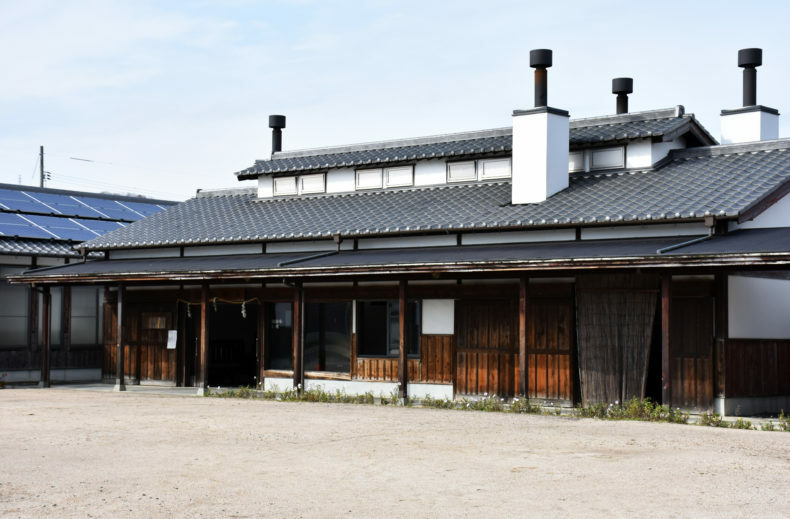 The closest train station to Bizen Osafune Sword museum is Kagato station. It is a 23 minute walk from the station. 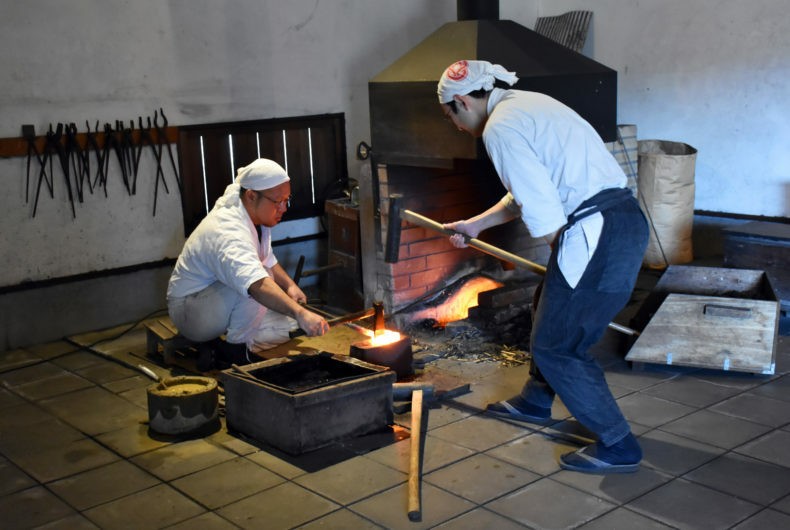 Bizen Osafune Sword museum is approximately 35 minutes by foot from Osafune station. Taking a taxi is recommended! Japanese swords are made of a type of steel called ‘Tamahagane’. ‘Tama’ means round and precious and ‘hagane’ means steel. First, the lumps of Tamahagane are heated and hammered into flat pieces, and then the pieces are divided into soft and hard, pure steel. The chosen pieces are then piled on the base that is made from homogeneous steel. The hard work starts now! The charcoal is heated to 1,300 degrees Celsius. The sword smith has mastered the art and can see and hear when the fire is ready. The steel is then heated, hammered flat, cut in half, folded and hammered flat again. This process is repeated many times to make the sword as strong and durable as possible. 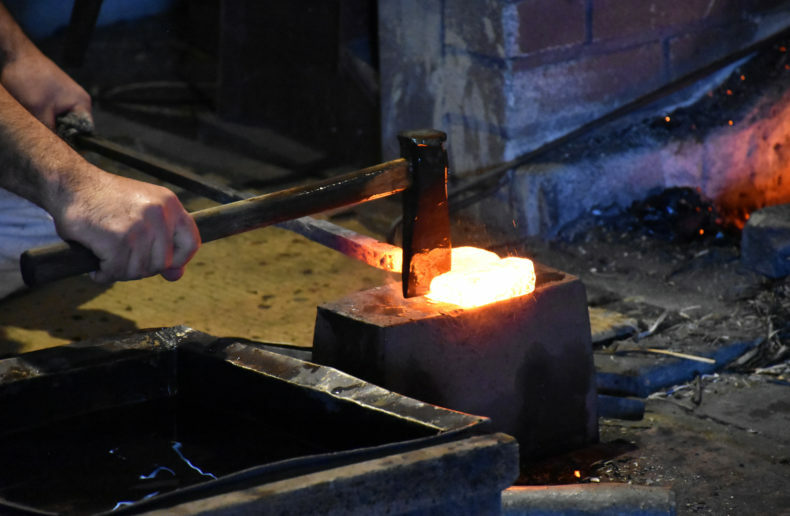 This process produces the soft steel that is used at the core of the sword. The steel is then cut into rectangles and piled evenly on top of the base and forged together. The softer steel is wrapped up in the harder steel in a U-shape that is folded and hammered flat and then folded again multiple times. The blade is dipped in a clay mixture between each folding in order to protect it from oxidation and carburization. Now it is time to create the shape of the sword! The steel is put in the fire and lengthened by hammering. Then the exact shape of the sword and the tip, called ‘Kiseki,’ is formed with a smaller hammer. At this point, all that is left to do is file the sword and quench it in water, where the blade starts to create ‘sori’, the bending of the sword. The blade gets a rough polishing before it is passed to the next craftsman: the polisher. The total weight of a finished Japanese sword is surprisingly light, weighing only around 800 g! Once the sword smith is done with his work, the sword must pass through several other craftsmen before it is complete. First, the polisher needs to sharpen and polish the blade. 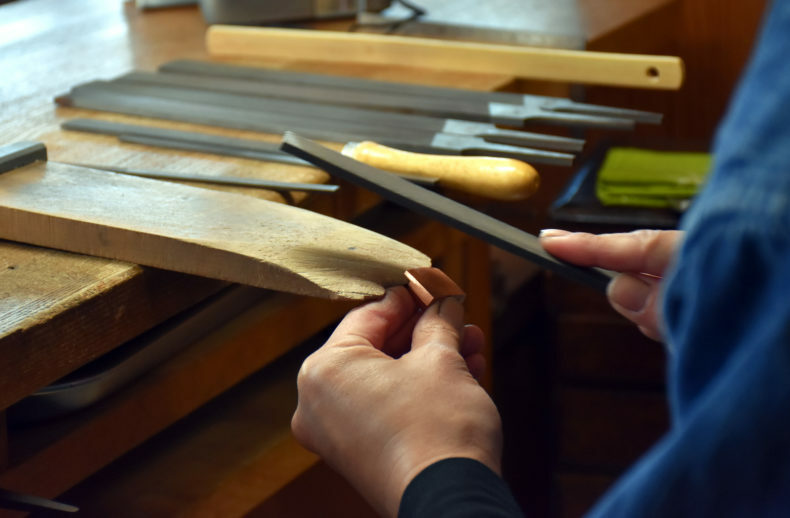 Japanese sword polishing includes 14 steps, and then the sword is passed to the engraver, where kanji or other images get engraved into the blade. Traditional Japanese swords include many small details such as a collar, called ‘habaki’, that prevents the blade from touching the scabbard. This are craftsman that specialise in making ‘habaki’. The scabbard maker makes the scabbard in magnolia. He makes two curved halves that are glued together with glue made from rice. This is a difficult job since the scabbard must fit the sword perfectly. 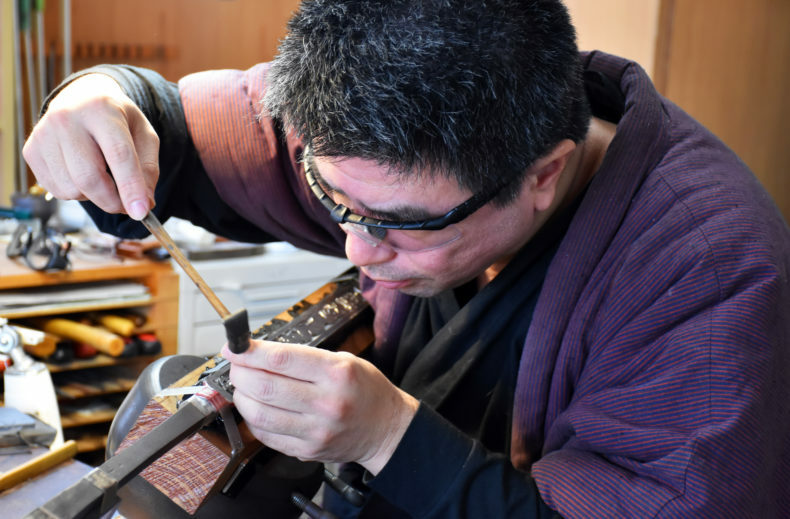 When the scabbard is finished, it is passed to the lacquerer who decorates the scabbard by using lacquer made from natural products such as minerals. Another craftsman who specialises in making hilts and binding makes the hilt. He makes the hilt from wood, and then covers it in the skin of stingray to create a strong grip. Silk rope is then used to bind around the skin in order to strengthen it. Metalworkers, guard makers and hilt decorators are other craftsmen that play a part in the final details of the sword. 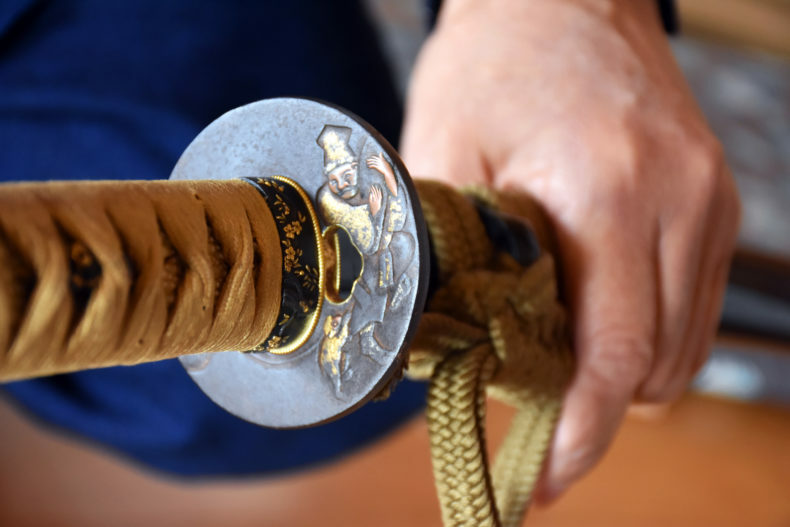 Not only is a Japanese sword about strength and durability, but also the visual beauty of each sword is equally important both to the craftsmen and samurai warriors. (November/25/2018)Welcome to Okayama Japan, the Land of Sunshine!! 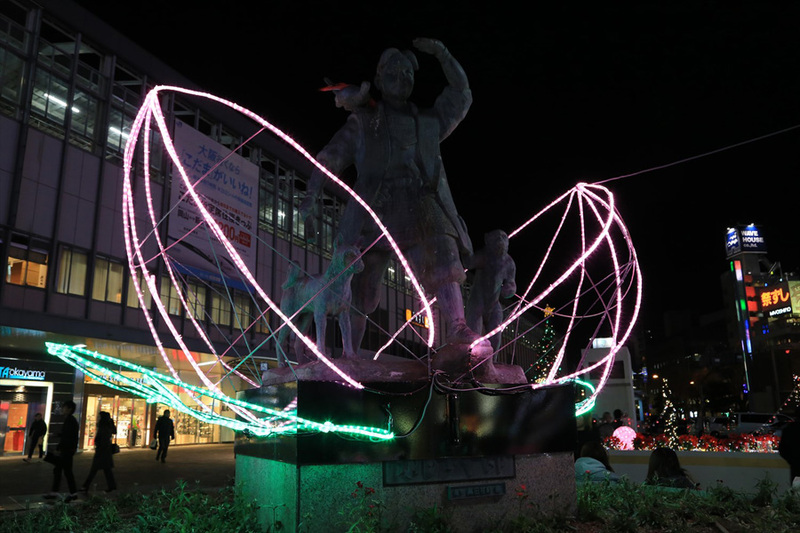 Momotaro Fantasy is a regular winter event when the area surrounding Okayama Station is illuminated. With a new theme each year, trees and other objects in the area are beautifully lighted up.